We didn’t want to always be fussing with multiple switches on the electrical system. The goal was to make it “like a laptop.” In other words, you just use it. If the state of charge gets below around 40%, make sure you park it in the sun to let the solar panels recharge or plug it in to a wall outlet. Don’t be fooled though – there’s lots of complexity in the electrical system. Maybe even more than necessary in order to get to the “like a laptop” state. The majority of the complexity is at the back of the van, behind the battery, which is mounted over the wheel well. 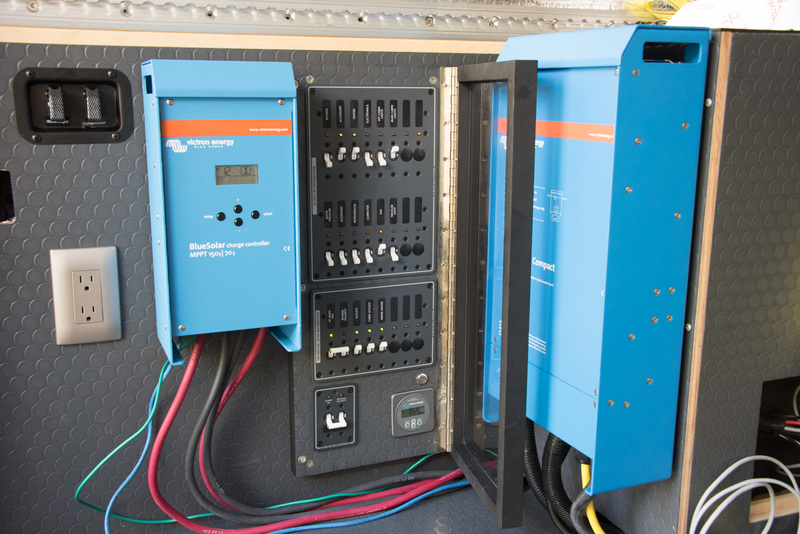 There are big blue boxes that house the solar controller and the inverter. The DC and AC Blue Sea Systems breaker panels and the 120v 30A shore power breaker are in the lexan-fronted cabinet. Those protect each of the circuits in the van. They also allow us to quickly turn something off either to troubleshoot or for instance so we can defrost the fridge. There are also some high-capacity switches hidden next to the inverter (blue box to the right of the picture). Those control overall battery on/off, solar on/off and DC panel on/off. There should never be any need to use them unless we are doing maintenance on the electrical system. Those messy wires are all hidden behind some 2″ x 1″ aluminum conduit with plastic corners and transitions now, too. If you look closely in the bottom right corner of the breaker panels, there’s a little circular push-in switch. I didn’t want the lighted labels from the Blue Sea panels to be on all the time. That switch turns them on so you can see what’s what in the dark. 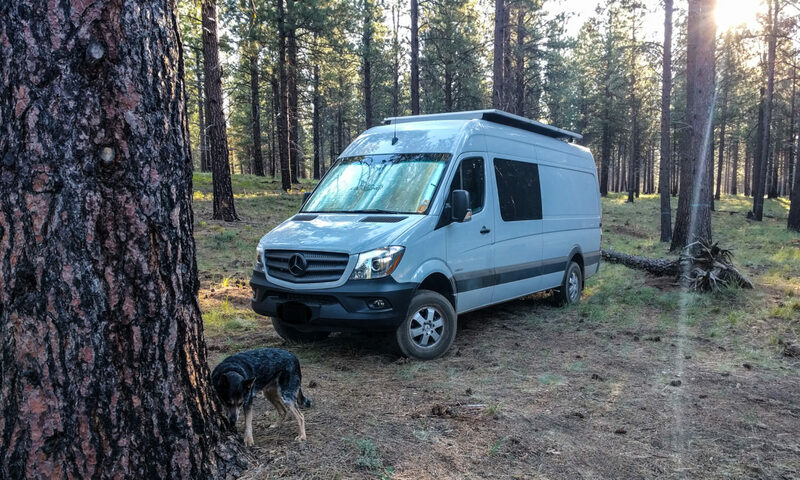 There’s also a Victron Energy BMV700 battery monitor there, but we don’t need to crawl around on the floor to read it because it sends its output to the front of the van along with the solar controller and the inverter. We were determined not to make it necessary to touch this stuff at the back of the van during daily use. About the only thing we really need to mess with for the electrical system in the vehicle is the Victron Color Control. This is what gets the output from all the other Victron devices. Even that is more a visual indication of our state of charge and how well our solar panels are replenishing the battery, rather than a way of controlling everything. You *can* control the Victron devices from here, but there just isn’t really any need to based on how we set the system up. All the lights are on separate switches at suitable locations around the vehicle. The thermostat for the diesel heater is also wall mounted close enough to reach from either the bed or the galley area. You’ll notice that there’s a common theme for all of the switch and outlet plates too. So long as everything is working as planned, there’s no need to touch the complexity at the back of the van. It’s just a matter of looking at the state of charge and reacting accordingly. If we really wanted to, we could go a step further and add an idiot light that comes on when the battery is drained to a certain level, but so far that’s not been necessary. Where did you source the aluminum conduit and transition flares? Eddie, thanks for asking. I’ve updated the post with some links. Here’s the details though. We got the aluminum surface raceway from cableorganizer.com. We used the 2″ x 1″ size. Amazon sell them now too. The plastic parts came from electriduct via Amazon. 90 degree elbow and what they call a “ceiling entry” (the transition flare). Considering the parts come from completely different companies, they fit together really well. The retention clips on the plastic parts are slightly oversized for the alu conduit, but you can trim them if you feel the need. We’re still happy with this setup. The alu and plastic parts have worked well for us. We’ve had the covers off the raceway twice since installing and it’s all gone back together with no issues. Perfect and thanks much for sharing out all of the build details. Great stuff. Your 120v receptacle looks very clean on the Penn Elcom plate. I’d like to set mine up the same and was wondering if you’d share the type of box you used behind the plate. Thanks in advance. The receptacles do end up fitting rather nicely in the plates, but you do have to do some cutting to fit them in correctly! The box behind is just a regular Carlon blue plastic single gang old work box. Around $1 at Home Depot. I drilled holes through the Penn Elcom plate for the receptacle screws, and those just go straight into the box and hold it firmly in place behind the plate. I am sorry if I missed it, but do you have a Smart Battery Controller? If so then where did you put your ground since you are connecting the electrical system that you built to the stock battery/alternator? My electrical box is behind the driver side rear wheel and needing to figure out where to ground my system. Any specs (like what AWG wire and pictures would be awesome). Brian, we don’t have a Smart Battery Controller. Our house battery system is completely separate from the van. Our house battery ground does not use the van chassis, and the battery is not charged via the alternator. There are grounding points under the driver’s seat. 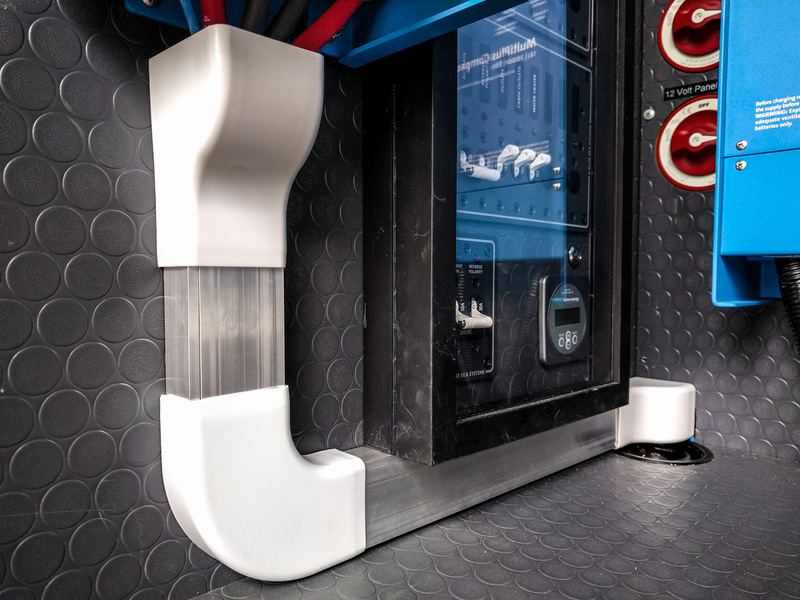 You can also create your own grounding point to the chassis anywhere you want, so long as you clean all the paint away to ensure a good electrical connection. The wire specifications will depend entirely on the size of your battery and your intended/maximum current flow through the system. Thank you! Now I see why I missed where you talked about your ground. I do wonder if the Smart Battery Controller is going to be worth it.